Yesterday I was out in the garden checking the lettuce plants we have growing, and I happened to look down from directly above a plant to see this pattern. 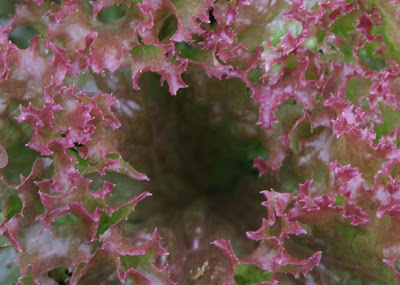 The lettuce leaves formed a complicated pattern resembling the precise mathematical form of a fractal. The very fine edges of each leaf are curled in a delicate pattern which imitates the fractal's recursive spirals. This is an example of how creation is so complete - the forms which our best mathematicians struggle with are reproduced in nature without any human intervention! Last night I was outside during twilight, and noticed this amazing sunset. The Sun has already disappeared behind the clouds, but rays of light are still shining out and covering the sky. Although the photo above might look touched-up, I have not digitally manipulated this picture. 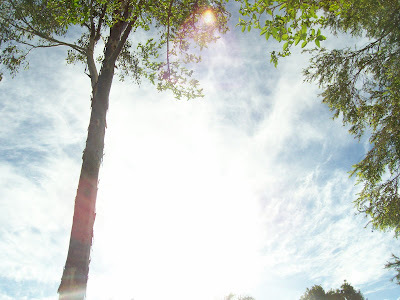 The duotone effect (where the sun and it's rays are black-and-white while the sky near the top of the picture is blue) simply occurred naturally. This is a capture which is not likely to be seen again soon, I was lucky to be out at the right time to see it. The photo below is of the same scene taken a few minutes later - you can see the huge difference between the pictures. 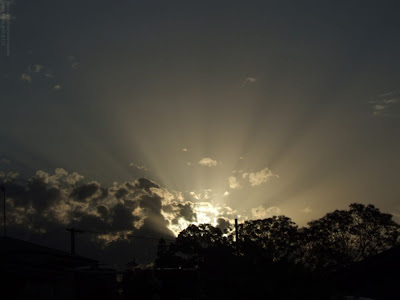 In the photo below, the sun has set and the rays of light from the first picture are entirely gone, replaced instead by a reddish glow near the horizon. Sunsets are always very beautiful to watch, and each one is different. As you can see from these photos, the scene changes even from minute to minute, giving you a very entertaining show. So why not step outside tonight, and have a look at this wonderful "theatre" of creation, free for all to see? 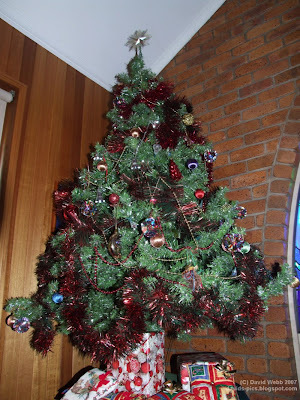 As it's Spring time here in Australia, all the flowers are blossoming and the trees are growing fruit. 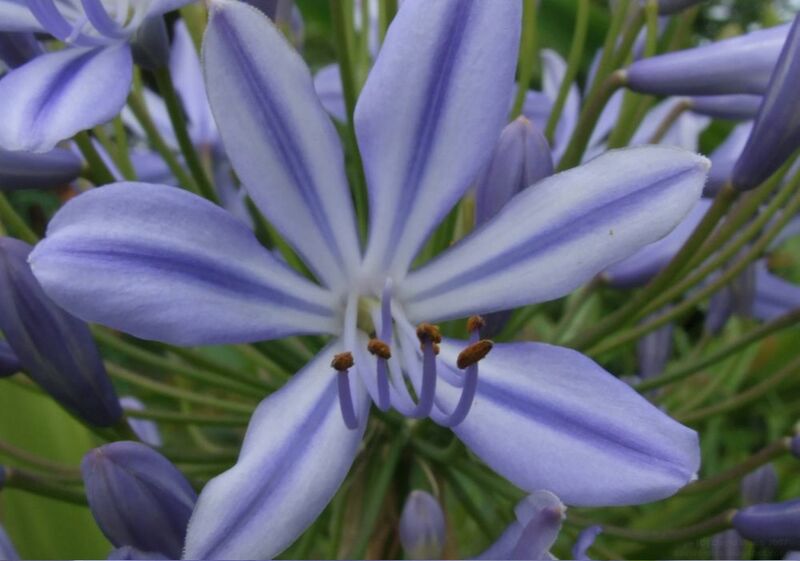 One of the variety of flowers blooming here at the moment is the Agapantha flower, properly called the Agapanthus africanus. These purple flowers are just starting to bud - when they have opened they will turn into a loosely hanging bunch of bright purple blossoms. 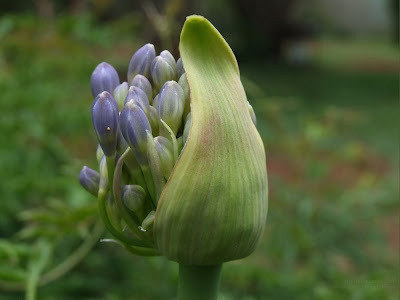 The photo shown above depicts an agapantha flower that is just beginning to blossom - the left half has started to unfold while the right section is still a bud. 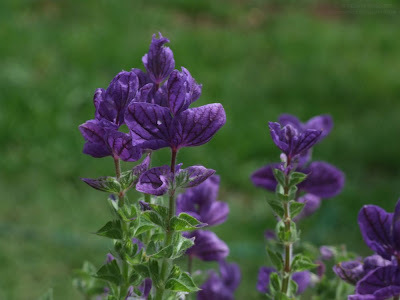 The green of the flower blend in with the green grass in the background, and contrasts nicely with the purple blossoms just beginning to peek out of the flower. 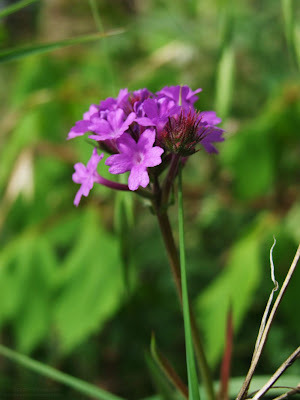 A this photo was taken with an aperture of F4.9, the background remains out of focus, thus keeping the attention drawn to the flower itself. It was overcast when I took this photo, so the picture has a very soft look to it. There was still enough sunlight available for me to avoid using a tripod, but there weren't any hard shadows on the underside of the flower - perfect lighting conditions. I'll try to track this flower for you and get some pictures of it when it's fully developed - in the meantime you might want to check out last Summer's agapantha shots. 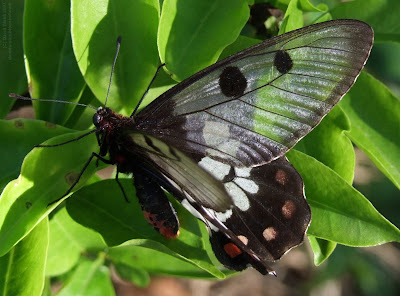 When I was walking down the street at Boreen Point (near Noosa) I spotted this butterfly resting in the Sun. It didn't seem to be moving, and presented the perfect opportunity for a photo. Butterflies are normally very hard to get on camera, as they fly all over the place only stopping for about 5 seconds at a time. This butterfly proved the exception however, and stayed still calmly while I got some close-up shots. Question: Have you ever Ego-Googled? David McMahon posts an interesting question on his blog: Have you ever Googled yourself? 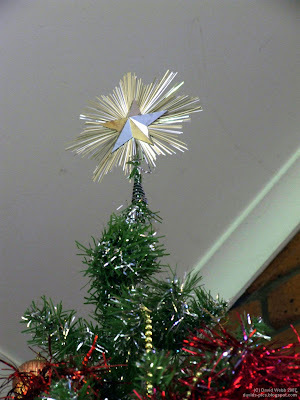 Of course not all of us are famous, so we may not be within the first 30,000 odd pages of a Google search for our name. This really depends on how obscure your name is. When I Google my fake name which I sometimes use for dubious registration forms, I am at the top of the list. That is because nobody famous has that name. However, in a search for "David Webb", I'm nowhere. What about you? Have you ever Googled yourself? If you want to answer this question, I encourage you to vote using the poll on the right hand side of this page. Next week we'll see how the votes fall - so keep posted! Update: I have recieved a lot of feedback on this post, and everybody who has commented has pretty much the same story as me: they have Googled themselves, but they usually don't rank very high, if at all. This concludes the question - most people have Googled themseleves. Here's an interesting shot I got at the Dubbo Zoo - a close-up photo of a giraffe's neck, with the hairs and markings clearly visible. 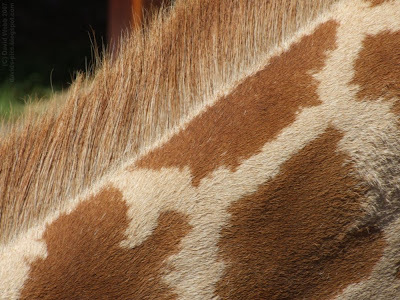 You can see that a giraffe does actually have a "mane" so to speak - there is a ridge of longer hairs along the back of the animal's neck. It's evident from the composition of this shot that "more is not always best" as David McMahon says on his blog. Sometimes you just have to ignore the whole and crop in on a small part of the object to achieve a certain effect. This photo turned out extremely clear and sharp, and seems almost as if you could reach out and touch the rough fur of the giraffe. This photo taken with the Fujfilm S9600 digital camera. As I mentioned in the last post, I've recently had the opportunity to visit the Western Plains Zoo in Dubbo, NSW. I took lots of photos (800+), so I've got lots of pics to post on this blog. For the first picture, I've chosen a subject that is uniquely Australian - an Emu. These emus were quite inquisitive, coming right to the edge of the "fence" to get their photos taken. With 10x zoom, I was able to get some good close-ups of the emus' heads. The photo above shows a head-on view of the emu, while the photo below portrays the bird from the side. Both of these photos seem to portray a sense of action and alertness, as if the emu is utterly aware of your presence and is waiting for you to make the first move. Overall the visit to the zoo was a fruitful exercise, and should merit a plethora of new photos for this blog. I look forward to sharing these photos, and I hope you will enjoy them too. I've been playing around with wide-screen photography, and the second emu photo in this post is an example of this. Hopefully I'll be putting up some of my shots in this format, it seem to convey a very different impression to standard 8x10 or 6x4 photography. I'm going on a holiday for two weeks starting from tomorrow, so I'm not sure if I'll have internet connectivity during that period. If I do manage to get connected during the holiday, I'll try to get something up, otherwise, see you all in 2 weeks. One of the places I'll be visiting is the Dubbo Zoo. This should be a great opportunity for some animal photos, something that I haven't had a lot of here lately. It's supposed to mimic African scenery, so that's even better. Remember, while I'm away you could always try browsing through the "label cloud" on the right of the page, or use the search box above it. I've got over 140 photos up here so far, so I hope that's enough to keep you amused while I'm away! First, let me tell you one thing - no, I did not use a telescope. A few nights ago I got out with the new camera, stuck it on a tripod, and got some shots of the (nearly) full Moon. When I looked at them on-screen later (and with a bit of cropping), this is what came up! I've never been able to take a photo of the Moon as accurate and detailed as this before, but with the Fujifilm S9600's 10.7x zoom these photos turned out remarkably clear. You can actually see the minute markings and dark patches on the Moon. I found, however, that using auto-exposure settings resulted in a washed-out Moon, even when I focused the camera on the Moon's radius. 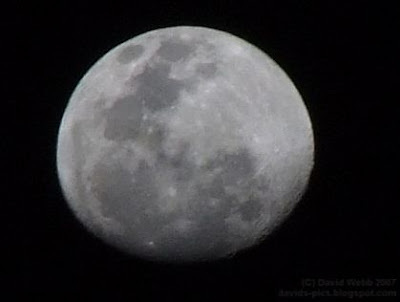 I actually had to increase the shutter speed to about 1/320 before the Moon's markings started to become visible. This also helped to make the camera steadier, so I was able to use an ISO setting of just 80. Later in the week I got up on the roof and shot the photo below. 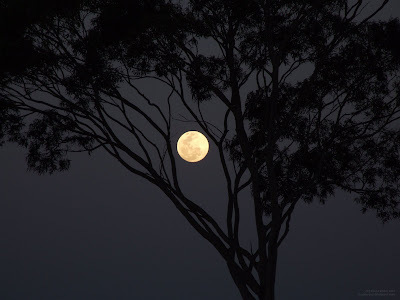 The Moon is framed by the branches of the eucalyptus, or gum tree which fills up most of the frame, and the tree in turn is highlighted by the Moon's light. This photo was taken at dusk, just after the Sun had set. After trying many times to get good Moon photos I had nearly given up, but this new camera has yet again proved its worth, managing to get some excellent photos of the Moon. My only piece of advice to potential moon-gazers is this - keep your shutters well up! 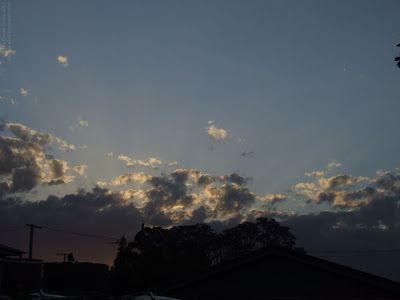 These photos taken with the Fujifilm S9600 camera. As you can see, I've had a great increase in blog traffic over the past few weeks. Now I'm going to have to stop posting about every 1,000 visits, because at this rate I should get about 1,600 per month! But it's not just the traffic that counts. As you will know if you have a blog yourself, the visitor loyalty is one of the key factors to ascertaining a blog's success. According to Google Analytics, about 5% of the visitors to this blog have returned 2 or more times. I think that's pretty good for 5,000 visitors - approximately 50 people have demonstrated some interest in the blog. As you can see, my agapantha flowers post seems to be very popular, but overall people tend to come here looking for nature photography. Finally, I would like to thank all the people who have visited and commented on this site, especially those who have subscribed. 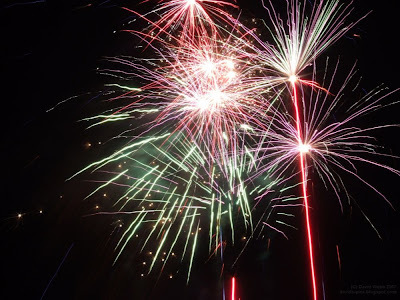 Running this blog has been a great experience so far, and I hope that you and many other readers will continue to enjoy it into the future. 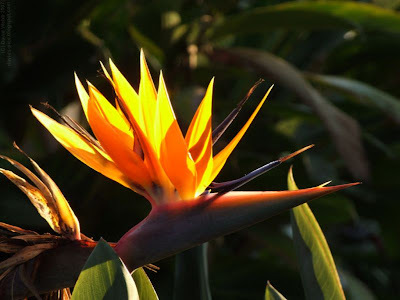 Bird of Paradise Flower - Spring has come! Spring is now in full bloom here in Australia. The grass is growing, the trees are blossoming with flowers, and the cicadas chirp at night. The Mozzies are biting, the flies are invading our homes, and a large portion of every Saturday is spent mowing the lawn. Everything is on the move. And, of course, all this life and activity comes with a host of new photographic opportunities. Yesterday afternoon I went for a visit to one of the local parks. The flowers there are in full bloom and provide great opportunities for macro shots. In that 2-hour session alone I took nearly 200 photos! Thankfully the era of digital cameras has alleviated the need for film, otherwise that session would have cost quite a bit. This bird of paradise flower is one of the hugely diverse species of flora to be found in the park I visited yesterday. I took this photo just before sunset, when the sun's rays shining through the flower give it a bright and intense colour, and highlight the "flame-like" crest of the flower. In the background, you can see another dead flower, which mirrors this one, starkly contrasting with its vigorous life. So far the photos I've got of this Spring have been mostly close-up, or macro shots, as the landscapes aren't quite out of Winter yet. But never fear, as soon as the landscapes come you'll be seeing them. At the moment I'm working on a photo-sequence showing the opening of flowers, so expect to see the results of that soon. In the meantime, sit back and enjoy Spring - mozzies and all! 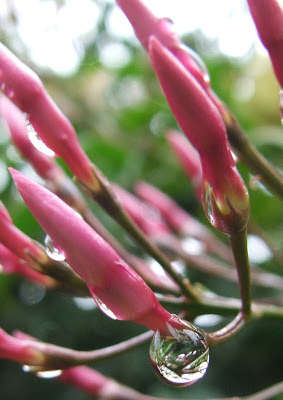 It's been raining here lately, so I though I might post a few of the photos I got just after the rain stopped. 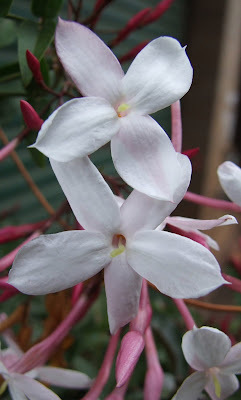 These photos all show jasmine flowers at their various stages of development. The Fujifilm S9600's super macro mode helped here to get really close up shots. 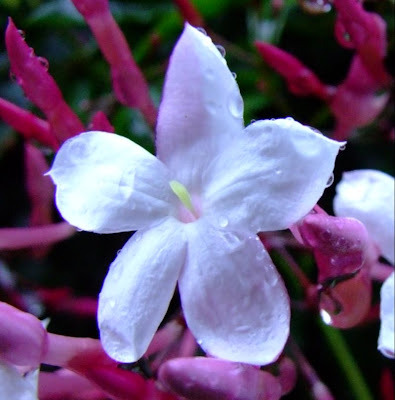 The two pictures on the left hand side show water droplets hanging off jasmine buds, while the photos on the right show fully opened jasmine flowers. 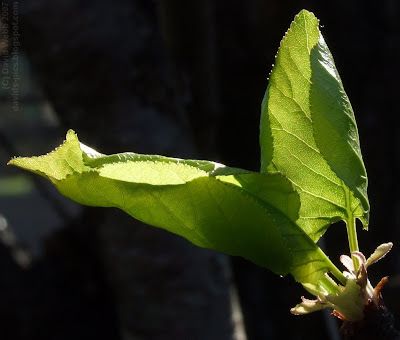 The First Photos from the new Fujifilm S9600! It's amazing how the best moments for photos seem to appear when you least expect them. Yesterday I was outside as soon as it stopped raining, taking pictures of the flowers & leaves all wet and bristling with dew drops. I got a few good photos which I'll get up here soon, but just as I was leaving I noticed some bees flying around the Pak Choy plants. I snapped some photos at a relatively high shutter speed, not expecting to get much out of them as the bees were moving very quickly. But it seems I had underestimated the new camera. The photos turned out quite well, even after I digitally cropped them to less than half their original size. I've included two of the best bee photos here. 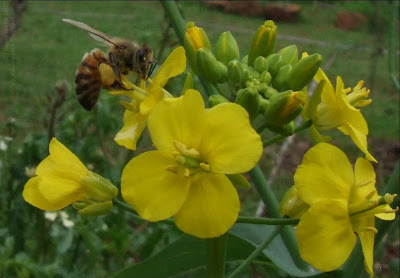 The first one (above) shows a bee hovering in the air mid-flight, about to land on a yellow Pak Choy Flower. You can actually see the bee's wings as they flap through the air at top speed. In the second photo (below) the bee has landed and is sucking the pollen from the flower. Notice the large yellow pollen sac at the middle of the bee's body. 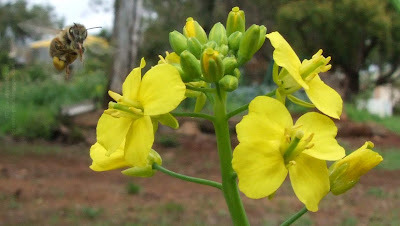 Again, the yellow flowers are from a Pak Choy plant. So far my experiences with the Fujifilm S9600 have shown it to be well worth the money. It certainly has exceptional macro capabilities, and it's great to have full manual control over the shutter speed and aperture settings. I'm looking forward to lot's more great photos in the months to come, and I hope you too can share in the enjoyment of this "wonderland of nature". Special Announcement: The 4,000th visitor arrived at this blog today from Papua New Guinea at 3:57:34 pm (Australian Eastern Standard Time). Most popular search term: hairy caterpillars. Average visit length: 3 minutes 47 seconds. Average pages viewed per visit: 1.58. Most popular page: The Sunflower that's not a sunflower. I would like to thank all those who have contributed to this blog either directly or by giving feedback by comments or emails. It is great to share the wonder of nature with other people through the medium of the internet and photography. Thank you all for you support! Finally, the days of 3x zoom are over! Yesterday I bought a new camera to replace the 4.0MP Kodak C330 that has served me faithfully for the last two years. Although I wasn't quite ready to make the jump to a (d)SLR, the model I selected has full manual features and most of the benefits of an SLR. Today I'll be playing with the new camera a bit, so expect to see some new photos any time now. After I've used the Fujifilm for a while I'll also try to post a review with the real life Pros and Cons of the camera, so keep an eye out for that later. Some of you may have already noticed the "Label Cloud" I recently added to this blog's sidebar. Where there used to be a simple list of categories, I have added a fancier, more aesthetically pleasing "cloud" of categories. If you look at the coloured bar on the right hand side of this page, you should see something like the following (you may have to scroll down): Basically, this "cloud" is just a list of all the photographic categories in this blog, but with a twist - the categories with more posts in them appear bigger in the list, while the less populated categories show up smaller. I hope that this new addition, along with the content rating system at the bottom of every post will help you to enjoy this blog more. So have a browse! Just click on one of the categories on the right to get started. And if you like a post, you can give it a rating simply by selecting your choice on the bar at the bottom of the post. Recently I watched the movie “Amazing Grace”, an excellent movie about the abolishment of the slave trade in 18th century England. It follows the political work of William Wilberforce, a politician in the House of Commons. This photo reminds me of the theme of the movie – through all evils and tribulations of this world, God and goodness will triumph. The bright Sun, shrouded by cloud, seems to be bursting forth from its corner of the sky, spreading the Light to all corners of the globe. This photo gains its impressive and triumphant effect mainly because of the parabolic nature of the image – the picture seems to have been taken with a “fish eye” lens, creating an effect of bulging in the centre. Surprisingly, I took this photo with a simple point-and-shoot Kodak C330 digital camera, and didn’t use a fish eye lens at all! The trees in this photo create a natural frame for the picture. The gum tree (eucalyptus) is slightly offset from the left edge of the photo, so your eye tends to be drawn towards the left hand side of the picture. On the whole, this picture conveys a sense of suspended movement and the glorious splendour of light. This picture, with its symbolism of light and goodness, is a reminder to us all to have hope for the triumph of good over evil. These two small groups of mushrooms are the type that spring up immediately after some rain, and then disappear as quickly as they came. 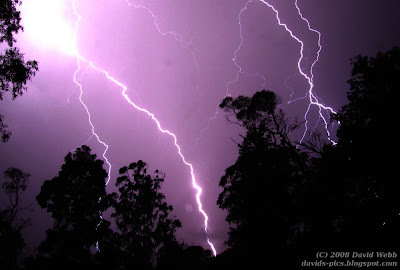 Although we have had a lot of rain here lately, I actually took these photos a few years ago when the Kodak C330 was new. 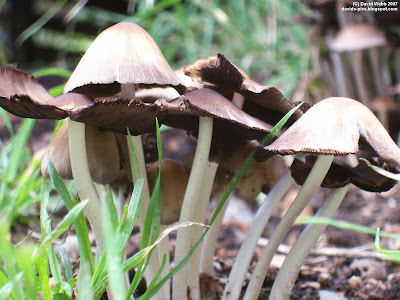 These photos depict two different types of mushroom, one group short with a slight brownish tint to their "caps", or "heads", and the other tall and thin, with flatter, white caps. I think this photo conveys a sense of silent, stealthy growth - the mushrooms appear to be "still life", but all the while they are quietly growing underfoot. 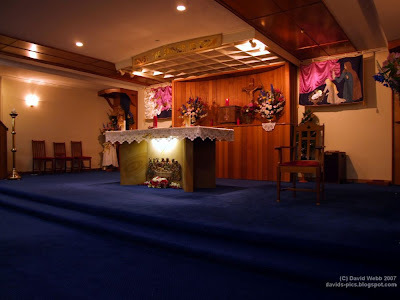 The first of these two photos has the popular "bi-focal" arrangement - two major subjects dominate the picture, complementing each other and providing an interesting field in which the eye can play. 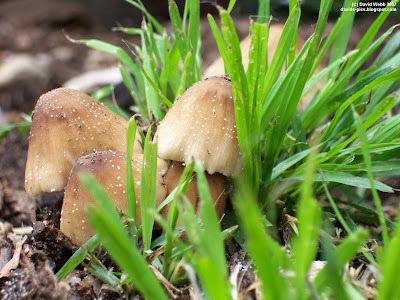 On the left, we have the tight bunch of 4 small mushrooms, while on the right a sprig of grass splays out, leading our eyes in the opposite direction. In the second photo, the mushrooms seem to be straining upwards, as if they aren't content with their meager height and wish to lift to more lofty realms. The grass too seems to be following it, pointing skywards, following the lead of it's overshadowing companions. The green grass and pale white stems of the mushrooms contrast sharply, and bring an extra aspect to an otherwise monotonous image. Both these pictures share a common theme, of still life, of nature, of minute activity in the undergrowth. Most of all, they demonstrate the wonder of God's creation, yet again, and remind us humans that we are not the only living things on this earth. This photo taken with the Kodak C330 camera. 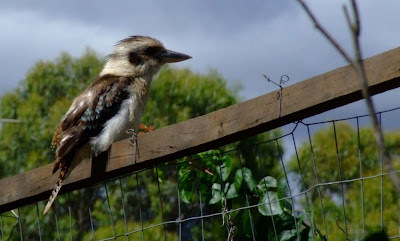 Recently I was walking around a friend's property, mostly Australian semi-rural bushland, when I came across this little creature. Although he looks frightening, the Bearded Dragon lizard is practically harmless, and refused to move a muscle even when we picked him up! Before moving him, I snapped this shot at an unusual angle. The detail in this photo is amazing when viewed full-screen, especially around the lizard's head - you can see every small spike and inflection in his scaly skin. Although, as I said, these lizards are practically harmless, they can give you a nasty bite if provoked, so don't go picking them up! This shot really makes you think. Whenever anybody looks at this picture they tend to automatically tilt their head counter-clockwise 90 degrees and look up and down the lizard's body. That's because of the unusual composition and depth of field in this photo. 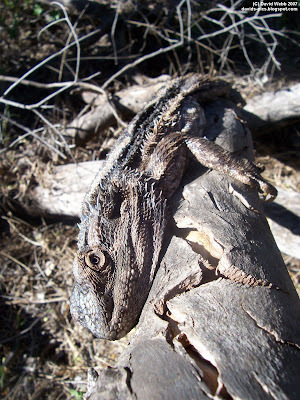 The Bearded Dragon's head forms the primary focus-point in the image, with the beady eye attracting attention at the top of the head, and the split bark of the log leading the eye towards the dragon's frill further down. I think the strangest thing about this photo is that you keep trying to turn sideways to look the lizard in the eye. The way the log and lizard combine to create an interesting "tilt" to the image helps to attract attention and create uniqueness. Just don't look at this picture too long - you might permanently bend your neck! 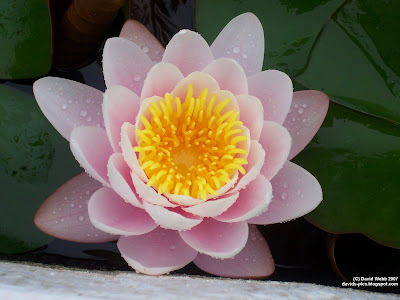 This Water Lily blossom is yet another example of nature's wondrous beauty. 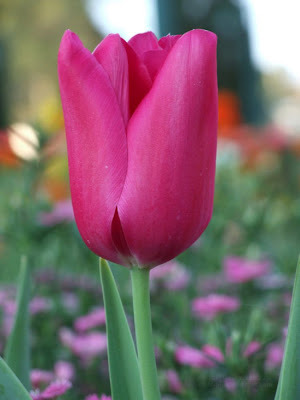 As with all flowers of this sort, the soft pink petals seem to serve as a showcase for the bright yellow center of the flower. Each petal has a delicate adornment of water droplets which help to bring time and depth to the photo. The background of lily-pads help show the close-up nature of the image. 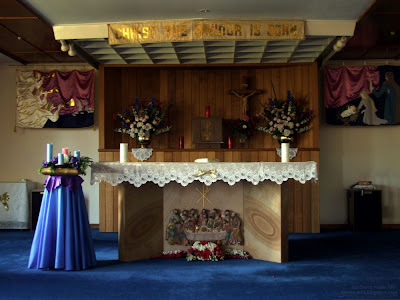 This photo was taken at Singleton, NSW, Australia. It shows a completely different aspect of Australia's natural heritage than the Dry Landscape shown before. This photo is really just a point-and-shoot picture - there are no special compositional techniques used, no fancy aperture or shutter-speed adjustments, just a simple fill-the-frame photo from about 15cm away. The only noteworthy aspect of this photo's composition is the familiar "concentric focus" theme coming through again - the main curves in the picture converge on the central subject of the image. Dry Australian Landscape - The real Aussie Bliss? When I saw this photo, I immediately thought of the Windows XP desktop background "Bliss" that many will know so well. It depicts an artificially green meadow with a perfect sky in the background, and some distant mountains. 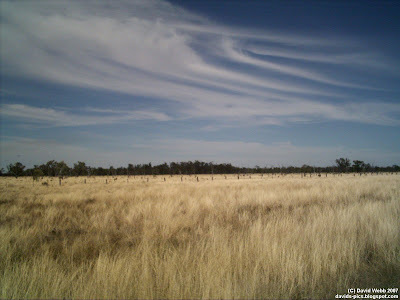 Well, this photo shows a far from perfect landscape, with the dry, parched grass and hot looking sky, but I suppose you could call this the "Aussie Bliss". 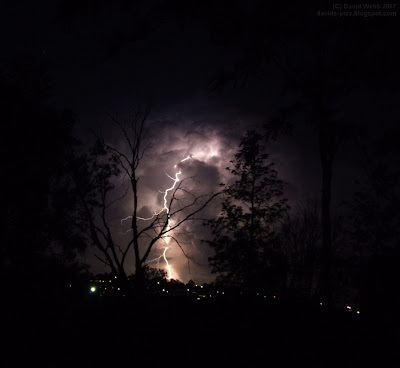 This photo was taken near Goondiwindi, in Queensland, Australia. This photo differs from the "rule of thirds" we have been seeing lately - the photo is plainly comprised of two sections split vertically by the tree line. Both the curve of the clouds and the pattern of the grass incline the viewer's attention towards the center-right of the picture, meeting the horizon as it reaches the edge of the image. The main feeling conveyed by this picture seems to be one of dryness, of a starved countryside that is deprived of it's utmost source of vitality. Yet the image also conveys a sense of beauty in itself, as if to say that no matter what happens, nature still retains it's equilibrium of life. This blog was classified as a spam site! Yes, Google officially prevented me from posting anything to my blog, as I was though to be a "link spammer" and my blog was classified as spam. I quickly submitted a request for revision, and just got notified today that my blog was "fair dinkum" and that I am now allowed to post again. Well, now that I'm able to post, I'll assemble a few statistics about this blog's visitors for the past few months. You're welcome to submit you favourite photos for inclusion in the upcoming best bits as well, I'll officially launch the "survey" soon. Since I posted the photo of a pumpkin flower under the title of "The Sunflower that's not a sunflower", I've had people ask whether I have any real sunflower photos. So I had a look through my archives and found this photo. 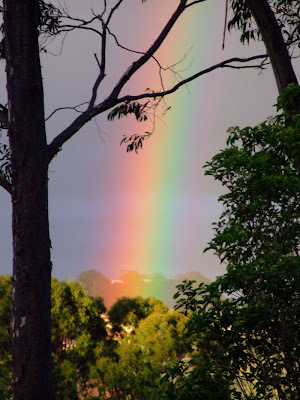 I took this shot a few years ago, when I had just got a new 4.2MP digital camera (the Kodak C330). 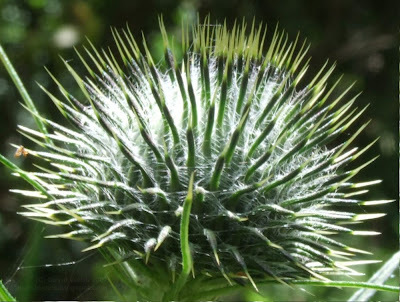 The level of detail is amazing - try viewing this photo full-size and you can even see the fine hairs on the leafy part. This would definitely do well as a desktop background. This photo really seems to draw you into it with a sense of depth and perspective, even though it has a relatively "flat" subject. 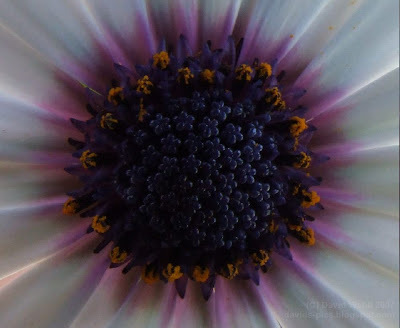 The circular center section with the stamen in it seems to bulge out, while the petals radiating from the center appear to bend inwards. The eye is particularly drawn to the center section, but this image has to be viewed as a whole to be fully appreciated. An interesting thing to note is the fact that this photo does not actually portray the whole of the flower. The edge of the petals are cut of by the framing of the photo. This is another important photographic technique which is used often and does not, as one might think, detract from the photo's beauty. I've been browsing through my old photos lately, and this is one of the shots that turned up. This photo depicts a cumulonimbus cloud heading a storm front, with the main thunder-head rendered in a pinkish hue due to the late evening sun reflecting off it. The storm clouds themselves are a threatening deep blue, and the black silhouette formed by the treeline and rooftops at the bottom of the image only serves to intensify the general atmosphere of foreboding. This photo, I think, truly imparts a sense of awe at the great power of creation. Moving on to a lighter note, this photo again uses a rough approach to the "rule of thirds". The silhouette forms the lower one-third of the image, the blue clouds another third, and the pink "anvil" of the cumulonimbus cloud rises toward the top of the frame. The focus seems to be divided between two areas of this picture - the pink thunder-head is the primary subject, and the blue clouds below it form the secondary subject. The main "breaking-up" devices in this picture are the two thin aerials rising toward the center of the photo - they direct the eye again from the lower section of the picture back up to the top again. But don't let the composition of this photo distract you from enjoying it's awe-inspiring effect. Just remember, the interpretation of art is always up to the viewer: Take this picture, think whatever you like about it, just make sure you have fun! "Oh no! ", I hear you say. "Not another contrast picture!" Yes, this is yet again a photo which has two contrasting sections of colour. I found this photo when I was walking around the yard, everything is so lush and beautiful right now after the recent rain - just the right time to get a close-up of what seems to be the Creator's favourite colour - Green. 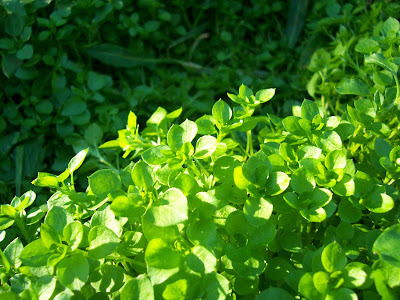 This photo could be said to use a diagonal variation of the "rule of thirds," as the illuminated, lighter weeds occupy about two thirds of the picture, and the darker, shaded weeds the other third. Notice how the sharp distinction between light and dark even within the lighter section itself helps to break up the monotony of an all-green picture. Note: For the Americans out there, this title would be spelt "Green is God's Favorite Color"
This indeed is a glorious shot. 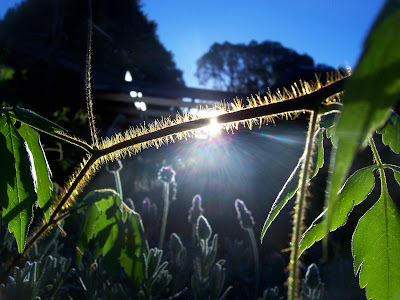 The rising sun is just peeking it's rays past the shining edge of a Balloon Vine stem, highlighting the fine hairs running along the side of the stem. The rainbow shower of light falling from the contact point shines out over the lavender flowers in the background, and the green leaves at the sides of this magnificent photo complete the image. This image has to be seen to be fully appreciated. The structure of this image roughly follows the popular "rule of thirds" approach, placing an imaginary grid over the picture to determine the placement of the primary features. 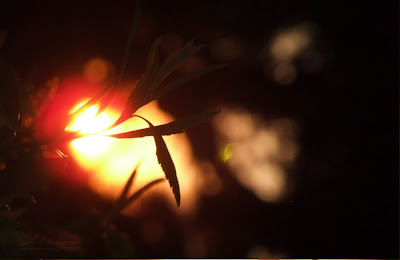 The contact point between sun and stem occurs about two-thirds of the way up the picture, and the green leafy frame occupies about a third of the horizontal space on either side. The weighting of this photo is obviously toward the top, with the bright contact point in the center of that region being the main feature of the photo. 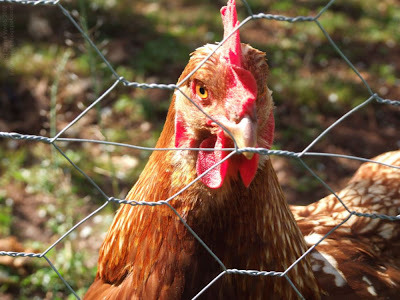 Here's some variety - an animal is featured as the subject of this photo. 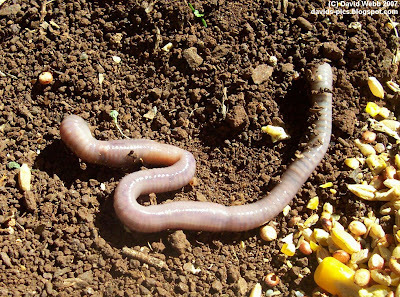 This earth worm is shown lying on the dirt beside some chicken-feed: various grains including cord and sorghum. We found him under a tarp we had out in the yard, and after the photo he died a noble death - he was fed to the Chooks! The natural structure of this photo draws the eye firstly toward the worm, which occupies the greater portion of the image, and secondly to the grains in the lower-right corner. The picture itself is not designed with a specific composition in mind, the only notable aspects are the main focus-points where the eye rests. It is interesting, though, how the eye follows a rough "zig-zag" course along the curves of the worm, and doesn't follow the smooth line of the worm's body. Whenever I look at this flower I'm reminded of the sun. The vibrant yellow color and the flower's ray-like petals are like an ancient Greek portrayal of the sun, with it's flares of yellow shining out from the center orb. 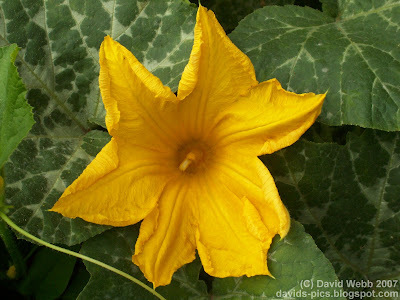 However, this flower is really only a humble Pumpkin flower, shown here in front of the Pumpkin vine's leaves. This is very much a "standard" type of shot from a compositional standpoint - the main object of the photo is centered in the frame, and the background is very plain so as not to attract attention. This photo is an example of how you don't really need any fancy framing or exposure modes and settings to take a good photo - this photo was taken in point-and-shoot mode! This photo taken with the Sony DSC-H1 camera.